To expand what we have been doing from mere advice and short home sessions we now have a premises where we can offer training facilities. The property was in dire need of work and TLC which we have been putting in since February 2018. Now the damaged swimming pool is filled, the garden refuse and badly damaged paving cleared up and we are left with amazing training space. We need the turf to cover the surfaces to be more friendly on puppy paws and protect parents from being beaten by the dust and sand lifted by the harsh wind that swirls around the property. We have a longstanding relationship with Synsport and they have kindly offered a hugely discounted rate on turf for us. Beagle in Mind is approaching training with a difference. With a focus on building relationships between Beagles and their human parents we aim to assist in seeing fewer perceived behavioural issues by embracing the quirky nature of the breed. 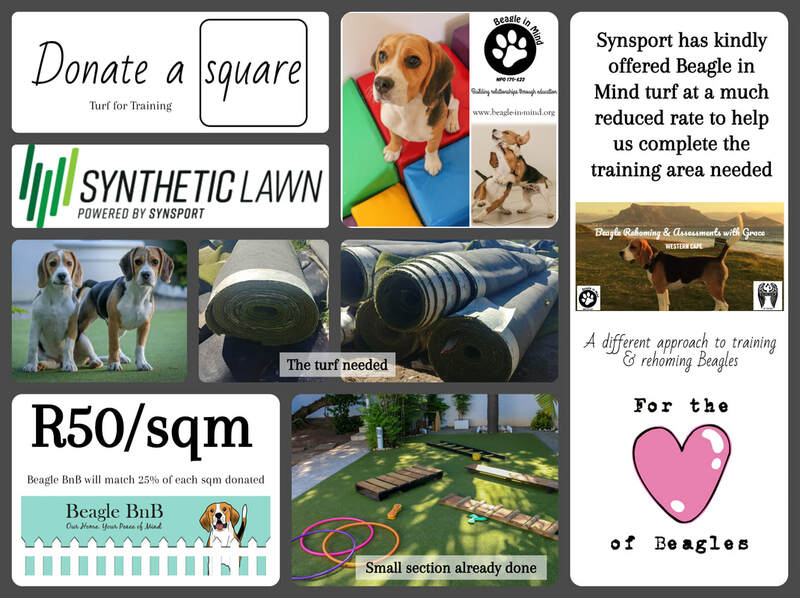 The Beagle BnB has promised to match 25% of whatever square meterage is donated and they challenge any other company to do the same or better it. Beagle in Mind is a registered PBO. Upon request we can issue you a tax free receipt for your donation.